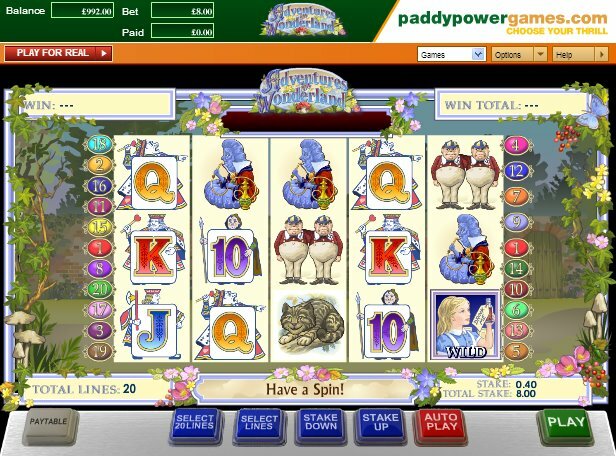 Alice’s Wonderland (also released under the pseudonym Adventures in Wonderland) is a dreamy 5-reel, 20-payline slot based on the classic children’s fairytale story by Lewis Carroll that has been developed by online slot game developer, Ash Gaming. The symbols on the reels in the game are full of the characters from the Alice in Wonderland story and the graphics help to recreate the magical feel that the book originally gifted so many children. Players that have also played IGT's fairytale-themed Pixies of the Forest slot and Sheriff Gaming's stunning 3D slot, Frog Royale, will feel right at home playing this slot. The slot is jam-packed with bonus features and the game is also tied into a progressive jackpot that is triggered through the Mad Hatter’s Tea Party Bonus. This bonus feature is triggered when you hit three or more Mad Hatter Scatter symbols across the reels. Once triggered, you are presented with four characters in the form of Alice, Dormouse, March Hare and the Mad Hatter himself. The longer the character you choose takes to drink their tea, the bigger the prize is that you will win. So, how is the progressive jackpot triggered in this bonus feature, I hear you ask? Well, you must keep a keen eye on your character when they start drinking their tea because if they add sugar to their hot beverage then you will be celebrating like there’s no tomorrow as you win the progressive jackpot. The Rabbit Hole symbol is also a key symbol in this slot. If you hit three or more of these symbols across the reels then you will trigger the Rabbit Hole Bonus. When this bonus feature is activated, Alice will fall down the rabbit hole depicted in the story and she will pick bonus prizes on the way back up. You can be awarded up to 22x your initial stake. Another feature included in the game is a Pocket Watch Bonus. The White Rabbit symbol triggers this bonus when you hit three or more of them across the reels. When this is triggered, the White Rabbit will look at his watch and it will land on a number of free spins that will be awarded to you. You can win up to 20 free spins in this feature. The White Rabbit will then leap across the reels and the symbols he lands on will turn Wild for the duration of the free spins. 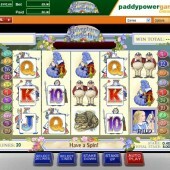 Alice’s Wonderland is a great little slot that has slipped under the radar. The bonus features on offer can give you some great prizes and the gameplay is pretty addictive. The progressive jackpot offers some nice side action too. The fact the slot is based on a popular children’s story that so many of us loved growing up only adds to the game's drawing power.